Hakuchou Custom in The Lost and Damned. 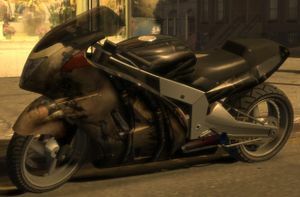 The Shitzu Hakuchou Custom is a sports bike, exclusive to the downloadable episodic pack The Lost and Damned for Grand Theft Auto IV. The Hakuchou Custom is a customized and improved version of the Hakuchou, lacking rear mirrors, and rear-mounted indicators and license plate, and featuring a custom paintjob resembling stitched skin, a single short exhaust that juts out of the engine block, an extended swingarm, custom rims, and a high-profile rear tire. Like its stock counterpart, it is based on a Suzuki GSX1300R Hayabusa. The Hakuchou Custom is by far the fastest motorcycle in The Lost and Damned (capable of achieving a top speed of around 110 mph or 180 kph), being faster then the Bati 800, Bati Custom, Double T or Double T Custom; the Hakuchou Custom is also the fastest accelerating motorbike in the game, just beating the Akuma. However, its engine's high torque and horsepower (suggested to be 300 to 500 hp), which gives the bike its speedy quality, also makes the bike susceptible to wheelspin and and poor grip when moving from a complete stop; at higher speeds, however, the bike is able to maintain grip, cornering without spinning out. The bike's brakes are also more responsive than that of the Double T Custom, allowing it to stop in shorter distances from high speeds. The Hakuchou Custom is Uptown Rider member DeSean's vehicle of choice. The Hakuchou Custom is named the Hakuchou Drag in the Uptown Rider's website. The Hakuchou Custom plays Electro-Choc or Radio Broker by default when ridden. Riding a Hakuchou Custom may cause the following cars to spawn: Willard, Regina, Sabre, Fortune, and Virgo. The Hakuchou Custom is hard to find, as it only appears in specific missions or side quests and does not appear commonly on the streets. It can be stolen from DeSean after Malc's first random encounter. DeSean is seen driving off on the bike after the mission is complete — if the player quickly catches up to him with a car or bike, the player can kill or dismount DeSean and take the bike. This will not affect the storyline — as the mission is complete, DeSean will be considered a pedestrian. The Hakuchou Custom may spawn in races if the player is riding a Hakuchou. The easiest way to take it is during the second Elizabeta's mission. It would be spawned in front of Pretty Boy's garage after mission. They will also spawn more rapidly if the player is already riding one. This can easily be done if the player uses the cheat code (245-555-0199). After completing Shifting Weight, the player can see DeSean riding away on one. If the player catches up there is a 50% chance it will be there. This page was last modified on 8 August 2012, at 09:35.